Explore, meander, take your time. Expand a personal moment into a human theme. Write about nature or death, faith or fidelity, as long as you write from a unique point of view: your own. – How do I move beyond me? – Does it have to be serious? If ever there was a prime platform for publishing personal reflections, it is the blog. Short for “web log,” the blog is by its nature a place to log your existence: to explore your thoughts through writing, to work through complicated feelings, or to share those flashes of insight you’re gifted with in the most mundane of moments. The blog is perfectly positioned for public journaling, and it was born for the writing task we take on this week: longform personal reflection. While many of us are already comfortable exploring our thoughts and opinions in our online homes, the pieces we publish on our blogs are often brief. We feel the need to accommodate the short attention span of the click-away internet world. And let’s face it, we’re worried that nobody is going to want to read about ME for 6000 words. Gorrindo engages the reader with a pinprick moment — a near-fatal jellyfish sting — and expands that moment: into memories and doubts, illness and insecurity, the fragility of life, and ultimately, into love. There’s no doubt that this piece is Gorrindo’s singular, personal experience. But the reader can relate because he has had these thoughts, fears, and insecurities too. This expansion into the universal is where the magic of the personal essay lies. Gorrindo’s piece isn’t 6000 words about her, it’s 6000 words about navigating life as a human being. A longer piece allows both the writer and the reader to slow down and surrender to the exploration of a personal episode, to reflect on it, and to expand it into something bigger than the reader or the writer. That sounds great, but how do I move beyond me? When writing a personal essay, you get to meander around your mind — wander, explore, peer into cracks and crevices — and mark your discoveries on the page. You may not know what you think or how you feel until you start writing. And writing longform allows you to plunge deep. At the same time, the personal essayist must be careful not to navel-gaze: this is a public piece, not a private diary. So how do you expand your story into something bigger that remains relevant? Use a specific episode as an entry point into a big theme: childhood, aging, love, loss, fidelity, nature, hunger. An instant is quickly amplified with questions of why? or how? Be vulnerable. Vulnerability makes you real. Vulnerability fosters trust. Readers relate to difficulty and how others have come through it. Be honest. Be honest with yourself. Be honest with the reader. If you are honest, the reader will trust you. And if readers trust you, they will follow you wherever you go. Anchor your writing with details — with concretes the reader can see, smell, and hear. Though the reader may have never SCUBA dived on a ship wreck, she can relate to the fear of sharks circling in dark waters. Always remember the reader. They’re not mind readers and they haven’t shared your experiences, so be sure to give them lots of entry points before taking them on a relatable journey. Like any self-contained piece of writing, the personal essay has a beginning, a middle, and an end. The beginning will generally introduce a question or musing, the middle will explore, and the end will provide a resolution to the question you ponder throughout the piece. As discussed in Writing 201: Intros and Hooks, you either snag or surrender your reader in your first few sentences. But the first sentence you write, the one that gets your metaphorical pen moving, does not have to be the opening sentence of your published work. Feel free to ask a question or use a prompt to get you going. Then, once you’ve gotten your thoughts out in draft form, take time to craft a beginning that hooks the reader and sets the tone of your essay. In the body of your personal essay, take your thoughts for a walk across the page. Attempt to answer questions of how and why. You can braid past, present, and future; chase your thoughts down a rabbit hole; or stroll the corridors of memory. Follow whatever path inspires you, and see where you wind up. A story consists of a sequence of actions that occur when a sympathetic character encounters a complicating situation that he confronts and solves. The deeper satisfaction comes when the reader learns with the character. The reader, like the character, thus becomes a better and wiser person. Be sure your resolution relates back to your introduction. It’s easy in a personal reflection piece to start on one subject, go off on several tangents, and then end up on a topic that is unrelated to the original thought. Personal essays that pack a powerful punch maintain at least one central issue that is reflected on and referred to throughout the piece: in the beginning, the middle, and the end. The words “personal reflection” seem meditative, contemplative, quiet. Especially when paired with thoughts of “resolution” and “growth in the character.” But when you laugh into a mirror, do you see furrowed brows? No. You see yourself laughing. Reflection does not have to be grave. You can be frank, you can be funny. You can be snarky, you can be somber. Your unique perspective, your voice, will dictate the tone of your work. The mood of your writing is entirely in your control. Humor: Whether it’s running errands, as in Elizabeth Urello’s “Errand Day,” or finding you are addicted to your Fitbit, as in David Sedaris’s “Stepping Out,” the mundane is fertile ground for hilarious introspection. Everyone can relate to the annoyances of an unsuccessful errand day, and even if you don’t have a Fitbit (I don’t), Sedaris makes you laugh your way through what it’s like to be driven by the need to take 10,000 steps a day. Lyric: Perhaps your subject inspires poetic language. Nature writing is often lyric and reads as a fusion of poetry and narrative storytelling. When you begin reading Terry Tempest Williams’s “The Glorious Indifference of Wilderness” you may wonder, “Is this poem? Is this prose?” Does it matter? It is powerful. The first time I cheated on my husband, my mother had been dead for exactly one week. Go long: find your inspiration and write it three ways. 1 topic, 3 writes: pick one item from the list and do three free writes on that topic. 3 topics, 4 writes: pick three items and explore them in separate free writes. Spend a fourth write tying the items together. 1 topic, 3 angles: pick one item and create a mind map. 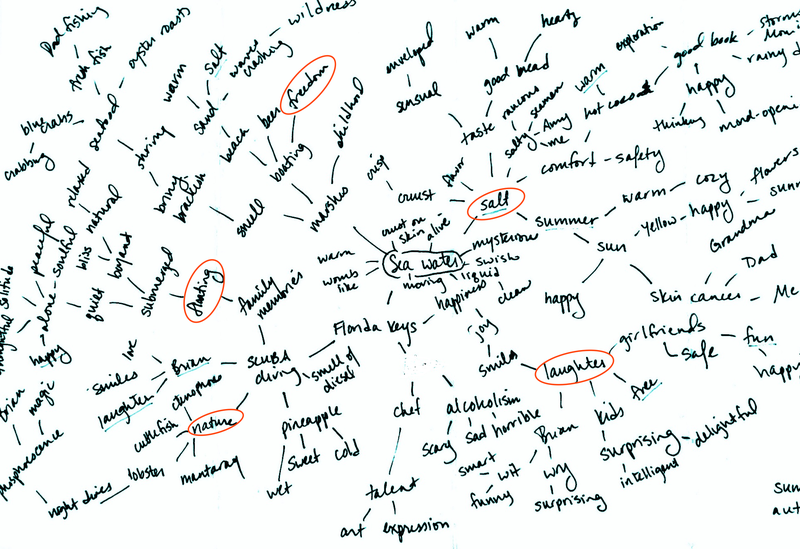 Write the word in the center of a sheet of paper, then spend 5-10 minutes spinning a web of associations. Use your mind map to find three angles around a central theme. 1 topic, 2 POVs: pick one item from your list and explore your relationship to it. Spend a second free write exploring a loved one’s point of view on that same issue. Spend a third free write tying the previous two together. An ideal way to enter into personal reflection is with a topic you don’t know the full story on: something that surprises, interests, scares, or mystifies you. Split your writing into three ten-minute sessions to ease into longform. Take a break. Read what you’ve written. Ask yourself, is there a question here that I’ve not answered? Is there another angle to this? The next day, set a timer for 10 minutes and write again. And again the day after that. Once you’ve written three separate pieces, read through them and ask, is there a way I can integrate these into a single piece? You may want to write again to draw conclusions and resolve your feelings about any discoveries you’ve made. When you feel you’ve found resolution, pat yourself on the back. You’ve written a personal reflection piece. Give yourself some time away from it, then go back and polish. Check that your resolution relates to your introduction, add formatting to organize your thoughts and spark visual appeal, and voila! You’re ready to share your discoveries with the world. We can’t wait to see what you’ve found. Looking for January’s Blogging 101 course?